Bangladesh, one of the most disaster-prone countries in the world, has a dynamic delta with 123 polders. Cyclone-induced storm surges cause severe damage to these polders. This paper presents an investigation of the inundation pattern in a polder due to dike failure caused by storm surges and identifies possible critical locations of dike breaches. Moreover, the risk of flooding was assessed and probabilistic flood maps were generated for the breaching of dikes. 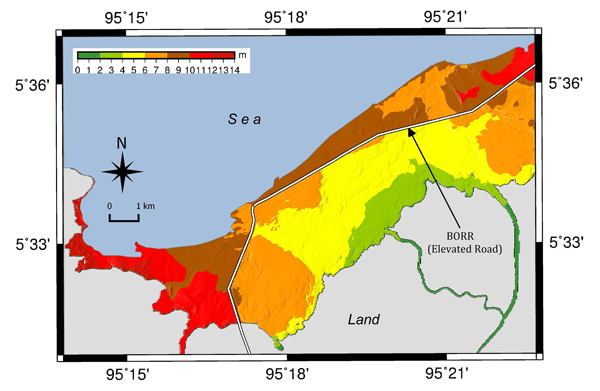 This research aimed to assess the tsunami flow velocity and height reduction produced by a planned elevated road parallel to the coast of Banda Aceh called the Banda Aceh Outer Ring Road (BORR). The Cornell Multi-Grid Coupled Tsunami Model (COMCOT) was used to simulate eight scenarios of the tsunami. One of them was based on the 2004 Indian Ocean tsunami. Two magnitudes of earthquake were used, that is, 8.5 and 9.15 Mw. The elevated road can potentially mitigate the impacts of future tsunamis. Landslides are destructive events, threatening the integrity of land transport systems. This paper presents how road networks are vulnerable to landslides, with emphasis on the consequences for affected road users. Results show the merits of using agent-based traffic modelling to assess the impacts of road network interruptions on rural communities by providing insights into the characteristics of the population affected and the effects on its daily routine in terms of detour costs. 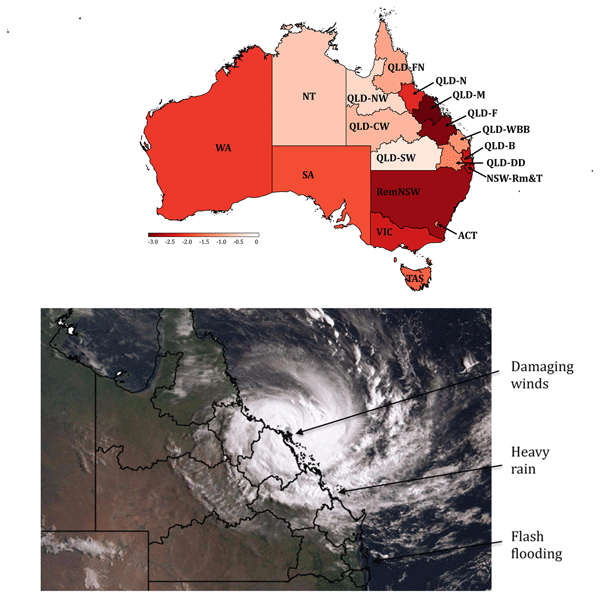 We use the Industrial Ecology Virtual Laboratory to analyse the impacts of Tropical Cyclone Debbie on the Australian economy. We show that industries and regions that were not directly affected by storm and flood damage suffered significant job and income losses, highlighting that producers in modern economies are strongly interconnected - initially localised production shortfalls can ripple through entire upstream supply-chain networks and severely affect regional and national economies. It is necessary to analyze the weight of multiple factors in the risk consequence of dam break. When the number of influencing factors exceeds 10, the analysis of its weight will become very difficult. In this paper, the cloud model, an artificial intelligence calculation method, is used to transform the subjective factors into a large number of data for the improved entropy weight method. The result is objective and reasonable, providing a new way of analyzing multi-factor weights. We adopted the projected rainfall coupled with the shallow landslide prediction, debris flow simulation, and loss assessment to investigate the impact in Xindian watershed, Taiwan. 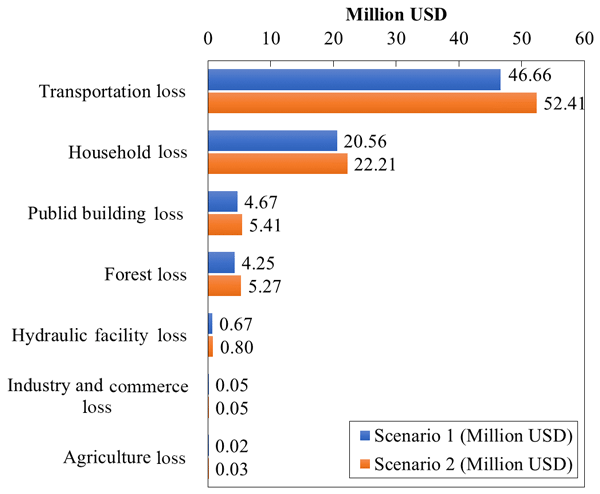 Upon comparing the worst events in the late 20th and 21st centuries, the economic losses are projected to increase by 27.8 % due to the increasing disasters on slope land caused by climate change. The influence downstream will be mainly in the form of indirect impacts such as a water supply shortage. Reducing disaster risks and adapting to climate change are ever more important policy goals. However, policies, methods, and practices across both policy areas often lack coherence, and opportunities are not fully exploited to build up resilience. The report "Climate change adaptation and disaster risk reduction in Europe" of the European Environment Agency identified several ways for how coherence and resilience can be built through knowledge sharing, collaboration, and investments. 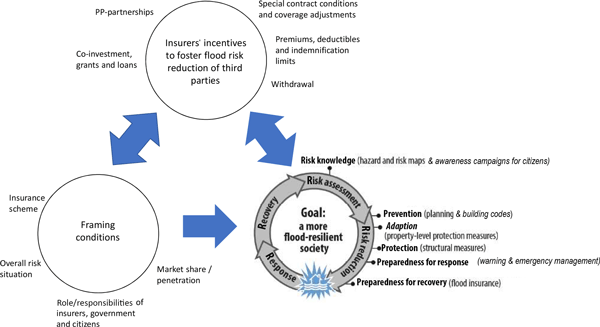 How do changes along the risk chain affect flood risk? 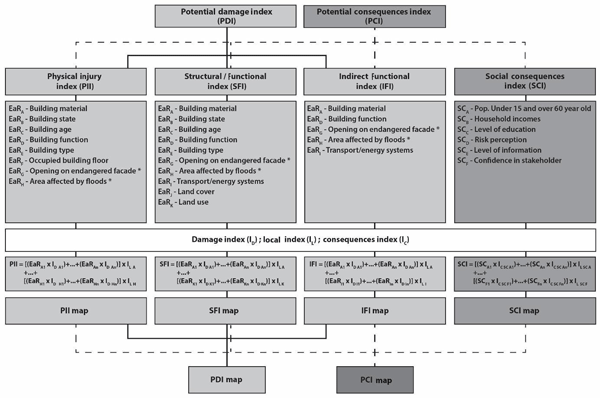 We present a comprehensive sensitivity analysis considering changes along the complete flood risk chain to understand how changes in different drivers affect flood risk. Results show that changes in dike systems or in vulnerability may outweigh changes in often investigated components, such as climate change. Although the specific results are conditional on the case study and assumptions, they highlight the need for a broader consideration of potential drivers of change in a comprehensive way. Sinkholes capture the attention of residents and local media. Cars fall through roads into holes caused by water escaping from burst water mains. To determine where impacts from burst pipes on other infrastructure are most likely, we investigated soil maps, infrastructure records and local media reports, and held workshops and interviews with infrastructure companies. We found that burst mains in high sand content soils were much more likely to impact roads, gas pipes, buildings and sewers. 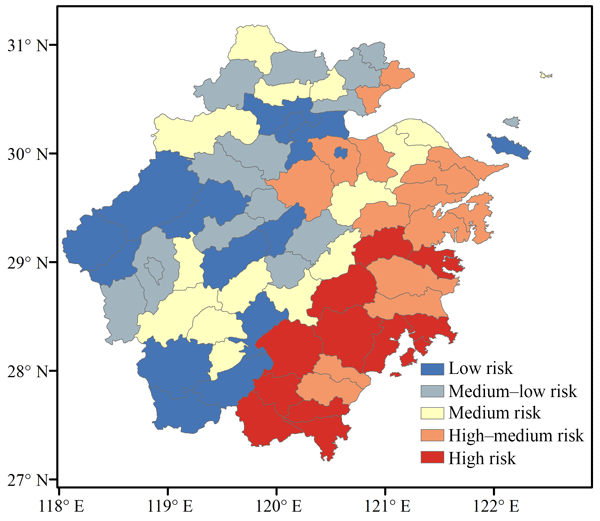 Based on precipitation and wind data over the mainland of China during 1980–2014 and disaster and social data at the county level in Zhejiang Province from 2004 to 2012, we establish a comprehensive risk index for typhoon disasters and use it to zone areas of risk. Some interesting results have been obtained. 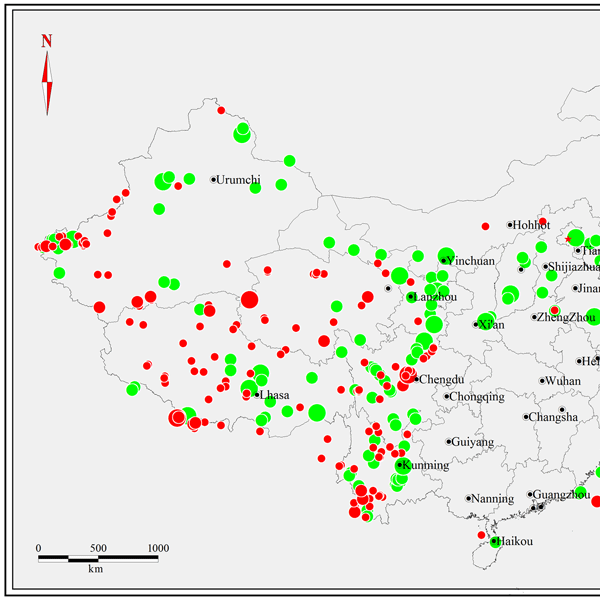 The risk of typhoon disasters decreases from coastal areas to inland regions in Zhejiang Province. The comprehensive risk index is a good reflection of the risk of typhoon disasters. 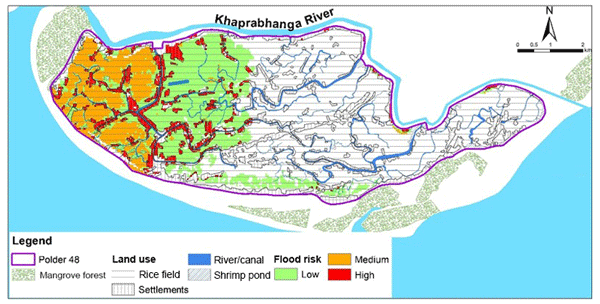 In this study we provide an estimation of flood damages and risks to rice cultivation in the Mekong Delta. The derived modelling concept explicitly takes plant phenomenology and timing of floods in a probabilistic modelling framework into account. This results in spatially explicit flood risk maps to rice cultivation, quantified as expected annual damage. Furthermore, the changes in flood risk of two land-use scenarios were estimated and discussed. Climate change can affect the safety of water infrastructures such as dams. However, related information is vast and scattered, and the assessment of these impacts remains complex. 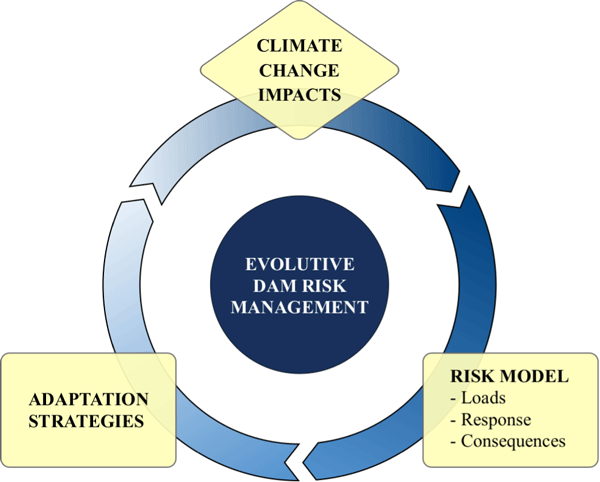 This article seeks a multidisciplinary review of the potential impacts of climate change in every component of dam safety. This will provide useful information for dam owners and dam safety practitioners in their decision-making process. We investigate the role of building value estimation schemes within flood exposure analyses on regional to national scales. 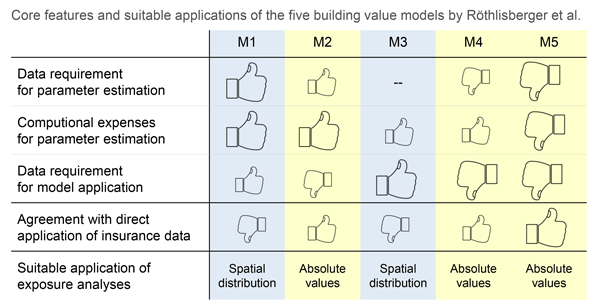 Our results for Switzerland suggest that models based on individual buildings produce more reliable results than models based on surface area, but only if they consider the buildings' volume. Simple models tend to underestimate the exposure, which results in suboptimal allocation of resources for protection measures in decision making processes based on cost efficiency. This paper introduces a methodology to support network managers in the quantification of the risk related to their networks. The method emphasizes the integration of the spatial and temporal attributes of the events that need to be modeled to estimate the risk. This work then demonstrates the usefulness of the methodology through its application to design and implement a risk assessment to estimate the potential impact of flood and mudflow events on a road network located in Switzerland. Tsunamis are natural phenomena that may cause great destruction when they reach coastal areas. 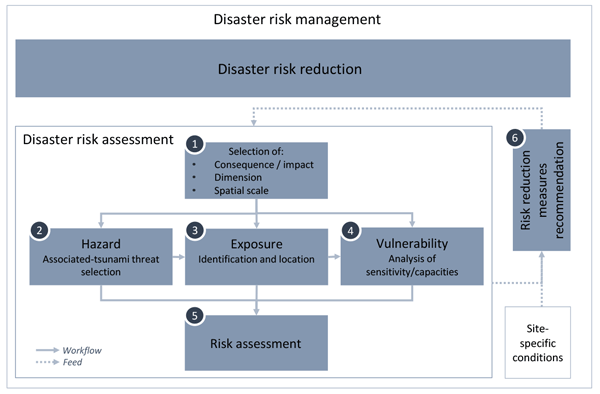 This study focuses on establishing a connection between technical and scientific tsunami risk assessment and disaster risk reduction. The ultimate goal is to reduce the consequences that a tsunami may have in tsunami prone communities, focusing on prevention and preparedness strategies, through the generation and application of useful tsunami-risk management tools. The work has focused on Oman. 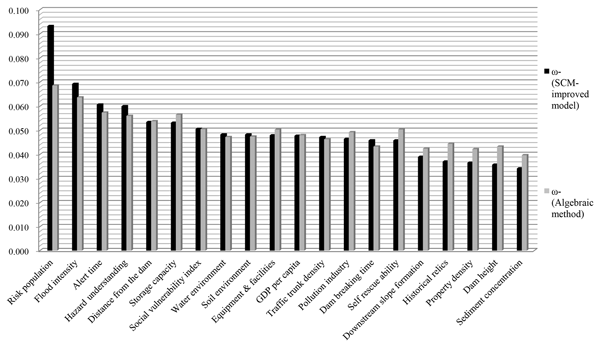 The objective of this research is to improve an index originally developed to assess physical consequences of a considered hazard, by including socio-economic characteristics of population information. Data from the French census and a survey on risk perception (questionnaires) were used to propose an index taking into account the three main phases of risk management: preparedness, crisis management and recovery. 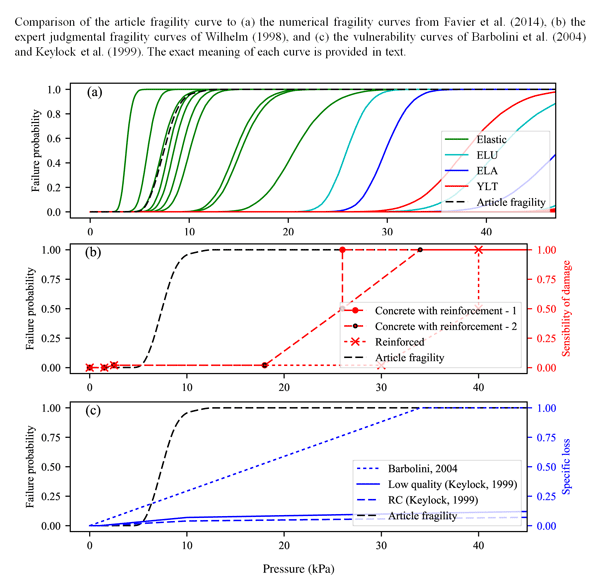 We examine sources of epistemic uncertainty in coastal flood risk models. We find that uncertainty from sea level estimations can be higher than that related to greenhouse gas emissions or climate prediction errors. Of comparable importance is information on coastal protection levels and the topography. In the absence of large datasets with sufficient resolution and accuracy, the last two factors are the main bottlenecks in terms of estimating coastal flood risks at large scales. One of the main volcanic processes affecting road bridges are lahars, which are flows of water and volcanic material running down the slopes of a volcano. In this paper, bridge failure models due to lahars are proposed and, based on these, fragility curves are developed. Fragility curves are parameterized by maximum likelihood estimation, assuming a cumulative log-normal distribution. Bridge failure models are empirically evaluated using data of 15 bridges that were affected by lahars. 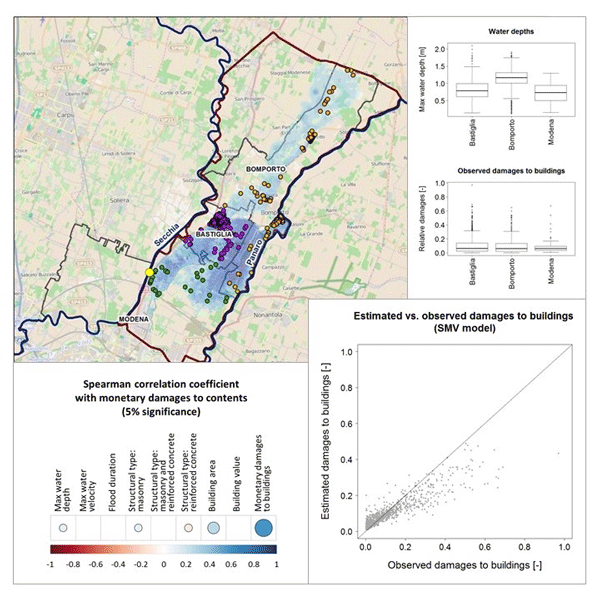 By analyzing a comprehensive loss dataset of affected private households after a recent river flood event in northern Italy, we tackle the problem of flood damage estimation in Emilia-Romagna (Italy). We develop empirical uni- and multivariable loss models for the residential sector. Outcomes highlight that the latter seem to outperform the former and, in addition, results show a higher accuracy of univariable models based on local data compared to literature ones derived for different contexts. A simulation of the building collapses and street blockages that are most likely to occur in the event of the next major earthquake in the historic centre of Bucharest was conducted in order to evaluate their impact on the provision of disaster response and emergency services. It identified those areas where the accessibility impacts would be most severe. These results are of value to local policy makers and planners seeking to devise targeted and effective disaster response strategies. To enable efficient coastal management, present and future scenarios must be included, risk reduction measures integrated, and multiple hazards dealt with. Process-based models are used to predict hazards at receptors. 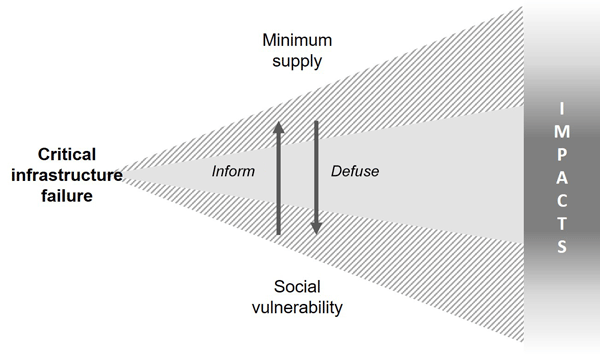 Impacts are calculated through vulnerability relations. Simulations are integrated with a Bayesian-based approach to link source with consequences. The tool is valuable for communicating risks and the effects of risk reduction strategies and as support for coastal decision making. Indonesia is one of the most vulnerable countries to disasters and climate change. The author did a systematic literature review on research topics and roles of Indonesian researches, indexed within Scopus from 1900 to 2016. Three major topics are found: natural hazard and disaster assessments; disaster risk reduction; and climate change risks, impacts and adaptation. Indonesian researchers still have limited progress in high-quality publications and international scientific collaborations. Landslides are causing serious problems worldwide. To improve the risk communication, a Web-based interactive landslide simulator is used in this study. The ILS tool is based on the assumption that landslides occur due to environmental factors (spatial geology and rainfall) as well as human factors. The ILS also provides feedback in terms of fatality, injury, and property damage due to landslides. Results of an experiment with ILS suggest improved performance with repeated and rich feedback. 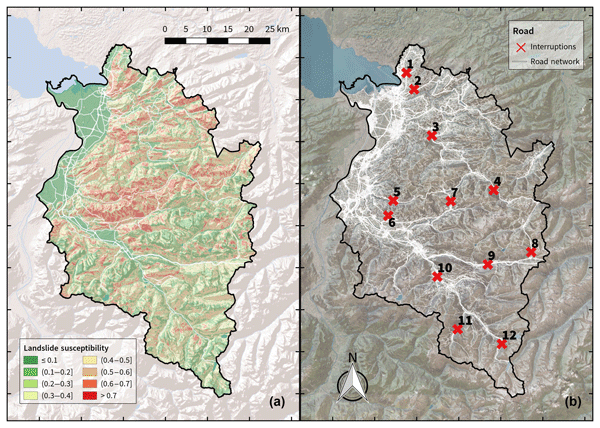 We study flood protection options in a pre-alpine catchment in southern Germany. Protection systems are evaluated probabilistically, taking into account climatic and other uncertainties as well as the possibility of future adjustments. Despite large uncertainty in damage, cost, and climate, we arrive at a rough recommendation. Hence, one can make good decisions under large uncertainty. The results also show it is preferable to plan risk-based rather than protecting from a specific design flood. 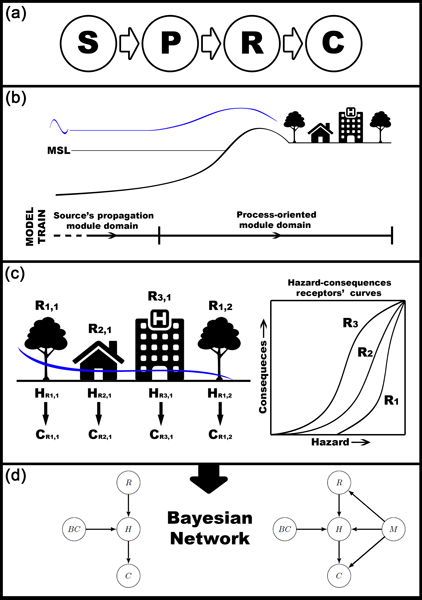 Flood loss modelling is subject to large uncertainty that is often neglected. Most models are deterministic, and large disparities exist among them. Adopting a single model may lead to inaccurate loss estimates and sub-optimal decision-making. 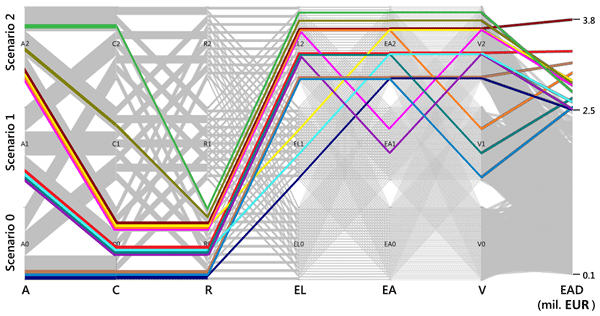 This paper proposes the use of multi-model ensembles to address such issues. We demonstrate that this can be a simple and pragmatic approach to obtain more accurate loss estimates and reliable probability distributions of model uncertainty. 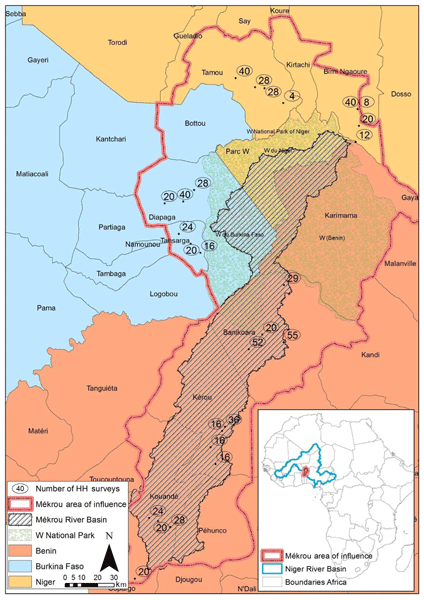 This paper presents an integrated approach to assessing floods and droughts in the transboundary Mékrou River basin, West Africa, combining climatic trends analysis and a household survey. The multi-variable trend analysis estimates, at the biophysical level, the climate variability and the occurrence of floods and droughts. These results are coupled with household survey data that reveal the opinions of local residents, the observed climate variability, and the costs of floods and droughts. Despite the increased attention given to critical infrastructure resilience in the context of natural hazards and disasters discussions on the role of social vulnerability assessments and minimum supply considerations for governing critical infrastructure failures remain scarce. Based on a structured literature review the paper responds to the identified gaps by developing a heuristic model on the linkages between the three topics and sketches out recommendations for a future research agenda. While the concept of snow and avalanche climates is widely used to describe the general nature of avalanche hazard, no research has described the hazard character of avalanche climates in detail. We use Canadian avalanche bulletin data that use the conceptual model of avalanche hazard from 2009/2010 to 2016/2017 to identify common hazard situations and calculate their seasonal prevalence. Our results provide detailed insights into the nature and variability of avalanche hazard in western Canada. Crop yields are routinely derived from meteorological variables, especially temperature. However, the primary water source for plant growth (soil moisture) is neglected. In this study, the predictability of maize yield is investigated using soil moisture or meteorological variables in Germany. The effects of soil moisture dominate those of temperature and are time-dependent. For example, comparatively moist soil conditions in June reduce crop yields, while in August they increase yields. The aim of this study is to develop and evaluate a methodology to estimate surface water flood damages from heavy precipitation in the Mediterranean region of study. 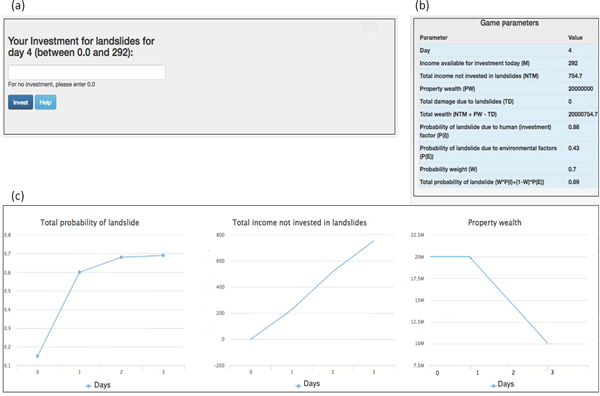 The relationship between precipitation and insurance data has been assessed, using logistic regression models, to assess the probability of large monetary damages in relation to heavy precipitation events. Results show that our model is able to simulate the probability of a damaging event as a function of precipitation. Refugee populations are often unaccounted for in population models used in earthquake fatality estimations. This paper calculates and compares fatality estimations produced with and without refugee populations in southeastern Turkey. Refugee populations added non-negligible contributions to earthquake fatalities at four of five fault locations, increasing total fatalities by 7–27 %. These findings show the importance of including refugee statistics in earthquake fatality estimations. We developed fragility functions of aquaculture rafts and eelgrass based on damage data and numerical simulation of the 2011 Great East Japan tsunami. These fragility functions explain damage characteristics of both items against tsunami flow velocity. By understanding these characteristics, damage estimation and loss assessment as well as marine/fishery disaster mitigation plan and management in other areas of the world from future tsunamis can be implemented. The emBRACE framework of community resilience conceptualizes resilience across three core domains: resources and capacities, actions, and learning. These are influenced by extra community forces, i.e. risk governance, societal context, disturbances and system change over time. It was developed by building on existing scholarly debates, on empirical case study work in five countries and on participatory consultation with community stakeholders where the framework was applied and ground-tested. Social vulnerability to natural hazards in Nepal is presented in this article. The findings highlight that most of the districts in Nepal are at a high to very high social vulnerability level. The western parts of the country are found to be more vulnerable than the central and eastern parts. This article examines the international policy and institutional frameworks for response to natural and man-made disasters occurring in the Danube basin and the Tisza sub-basin, two transnational basins. Monitoring and response to these types of incidents have historically been managed separately. We suggest that these distinctions are counterproductive, outdated, and ultimately flawed, illustrate some of the specific gaps in the Danube and the Tisza, and propose an integrated framework. Floods cause damage to people, buildings and infrastructures. Due to their usual location near rivers, water utilities are particularly exposed; in case of flood, the inundation of the facility can damage equipment and cause power outages. Such impact lead to costly repairs and disruption of service affecting indirectly people outside the inundated area. 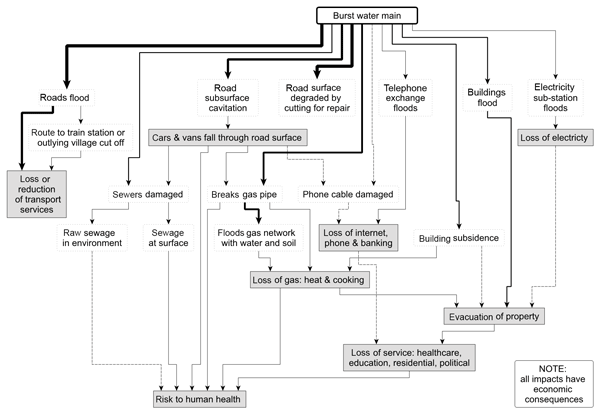 In this work a method to estimate the impact of floods on a water distribution system is introduced and applied to a case study. Flood defences, such as levees, emergency storage basins or storm surge barriers, can be designed as multiple lines of defence. If each line of defence has a number of possible levels, the total number of possible system configurations can be large. 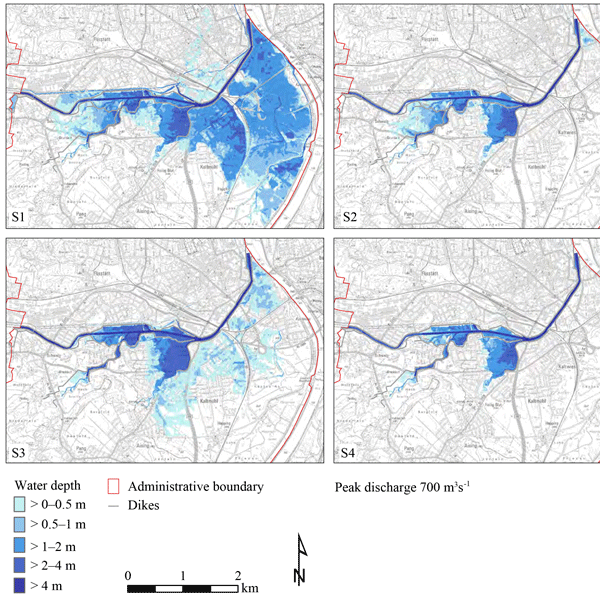 This paper presents an approach that is able to find an optimal configuration including future adaptations of such a flood defence system, based on an economic cost–benefit analysis. Scour (erosion) during floods can cause bridges to collapse. Modern design and maintenance mitigates the risk, so failures are rare. The residual risk is uncertain, but expert knowledge can help constrain it. We asked 19 experts about scour risk using methods designed to treat judgements alongside other scientific data. The findings identified knowledge gaps about scour processes and suggest wider uncertainty about scour risk than might be inferred from observation, models or experiments alone. We plot the dike costs divided by their length as a function of height and test four different regression models. Our analysis shows that a linear function without intercept is sufficient to model the costs, i.e. fixed costs and higher-order contributions are less significant. We employ log-normal distributions and calculate that the range between 3x and x/3 contains 95% of the data, where x represents the regression value. We compare estimates from Canada, the Netherlands, US, UK, and Vietnam. On 27 February 2010, a devastating tsunami Mw 8.8 was generated off the coast of Chile, causing the death of more than 500 people. In Dichato (37° S), we analyzed new risk areas derived from the process of reconstruction, and we compared it with risk analysis prior to the event. Six years after the event, we determined that the new risk configuration is similar to what existed previously. The process of reconstruction has not been undertaken effectively to reduce the risk levels in the area.